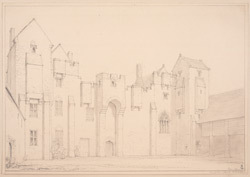 This pencil drawing is an exterior view of Compton Castle in Devon. Compton Castle is an outstanding late medieval fortified manor house. Although its imposing facade was built in 1520, the great hall, at the centre of the property, appeared in the mid 14th century. As with other manor houses, such as Oxburgh Hall and Penshurst Place, the emphasis of the building's design lay in visual impression rather than functional defensibility. Sir Humphrey Gilbert, half-brother of Sir Walter Raleigh and founder of Newfoundland, lived at the house during the 16th century.